Mushroom Model Publications is based in the UK. All their books are printed in Sandomierz, Poland by Stratus in English. Stratus also publishes books in the Polish language. This new book is the first of what is to be a 2 volume set. It is hard-bound with 208 pages in 8 ½” x 12” page format. The cover shows 2 Brewster “Buffalo” aircraft flying along in black and white above a color photo of a Fokker D-XXI on a grassy airfield in front of a forest in the background. 85 black and white photos of the Fokker D-XXI, one color photo of it and 25 color illustrations. 13 black and white photos of the Bristol “Bulldog” and 2 color illustrations. 33 black and white photos of the Gloster Gladiator II and 10 color illustrations. 60 black and white photos of the Fiat G-50 and 16 color illustrations. 75 black and white photos of the Morane-Saulnier MS 406, one color photo and 17 color illustrations. 73 black and white photos of the Brewster Buffalo, 3 color photos and 21 color illustrations. Some of the color illustrations are top views of these aircraft, but the majority of them are side profiles. There are also some illustrations of squadron logos too. There is an appendices at the back of the book and a color photo of a captured Bf-109G in Finish markings. This book gives good histories of these aircraft. The color illustrations were done by Karolina Hotda. Kit no. A091 Caudron C714C1 in 1/32nd scale. Kit no. SH32004 a model 239 Buffalo in 1/32nd scale. Kit no. SH32019 Morane-Saulnier MS-496C1 in 1/32nd scale. Kit no. SH32023 Hawk H-75 in 1/32nd scale. Kit no SH32044 Fiat G-50 II Serie in 1/32nd scale. Kit no. SH48050 Blackburn Roc Mk. I in 1/48th scale. Kit no. SH48073 Fokker D-XXI in 1/48th scale, with Wasp Junior engine. Kit no. SH45078 Fokker D-XXI in 1/48th scale, with Mercury engine. Kit no. SH48124 Fokker D-XXI 2 in 1 kit in 1/48th scale. Kit no 72526 Fokker D-XXI in 1/72nd scale. Kit no. 72527 DC-2 in 1/72nd scale. Kit no. A011 Hanriot H-232/2 in 1/72nd scale. Kit no. A075 Morane-Salnier Ms-410C-1 in 1/72nd scale. Kit no. Pl7011 Hughes H500E helicopter in 1/72nd scale. Kit no. SH72067 Heinkel He-59B/D in 1/72nd scale. Kit no. SH72113 Fokker D-XXI in 1/72nd scale. Kit no. SH72116 Fokker D-XXI with skis in 1/72nd scale. Kit no. SH72141 Blackburn ROC Mk. 1 in 1/72nd scale. 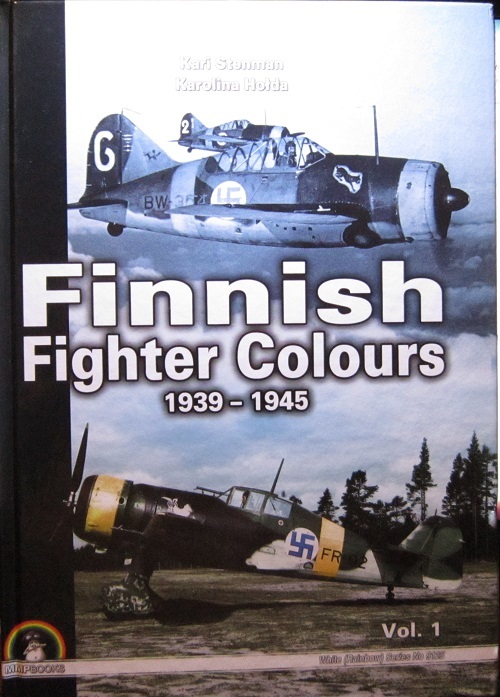 The back of the book shows the cover art of what will be volume 2 of Finish Fighter Colours. This one will feature the Hurricane I and IIa, the Hawk 75A, the Caudron CR.714, the Bf-109G and G6, the Myrsky, I-153, I-16, Lagg 3 and the P-40M. I highly recommend this book to modelers and also aircraft historians and enthusiasts. The north American distributor is Casemate publications.